I’m sure you have read tons of different BEA posts by now, and you will find amazing tips that you’ll need for your first BEA or tips you might not have known even though you were already there before. I’m sure you know things like dress nice but casual, wear comfortable shoes, and these kinds of tips so we won’t repeat them here! Rather, we would love to talk about what you can really expect from BEA. Keep in mind that this is an event mainly for Book Industry Professionals, and Bloggers like us should be thankful that we are allowed into the holy halls. This also means that the main focus of this event is to make connections within the Book Industry, meet authors you want to feature and just network! Even though this is a professional event, no one can hide their excitement while being there. Everyone who attends loves books just as much as we all do, and you can feel the excitement in the air. Still, my point is do act professional. That is the main tip and I think most important one I’d love to give. This includes running, being rude, cutting the lines, and grabbing too many books. Again, I’m sure that you’ve heard these before, but it doesn’t hurt to say it again. One of the most important aspects for us in attending BEA is to meet up with the publishers. Meeting your contacts that you have been working so closely with? Yes, here is your chance. Maybe there is a publisher that you do not have any contacts with? Then BEA is your chance to make those connections! I loved meeting and talking to publishers over these last years, and they were all so amazingly friendly and welcoming. I never had the feeling of being left out because I’m a blogger. I think that publishers have truly begun to value what we are doing, so they treat us accordingly. Take your time and look for an opportunity when the booth is not overcrowded, and then go and introduce yourself. Say who you are, what you do, and that you’d love working with them. Maybe tell them which book you are excited about because that is most definitely always an ice breaker. *Pushy pops up* And, as I’m sure you’ve ready before, here’s the perfect time to have a business card ready, especially if you’re trying to make a new contact. Even when you catch a contact at a booth’s down time, remember these folks have A LOT going on. Keep it short, simple and positive and leave them feeling good about you…it will pay off when they follow up, because many of them do! Connect with your favorite Authors! 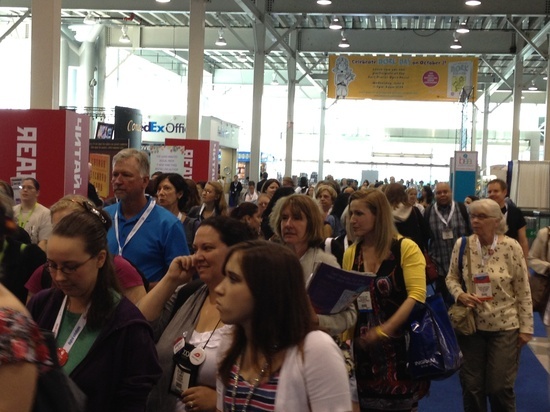 There are tons of amazing and wonderful authors at BEA each year and this is your chance to meet them. However, during a signing you won’t have much time. All you can say is a few nice words, hand them your business cards and that’s it. Don’t stay too long as the lines are always pretty crazy and everyone would like to get a shot. But maybe you’ll see them running around at BEA and if you are brave, that is the better chance for a nice chat! Even though BEA is over the course of regular business hours, the day does not end when you leave the halls. There are parties, events, blogger meetings and a whole lot of fun you can do when the convention doors close. I just treat this event as an outside of BEA event because it is the day before BEA. Much has been said about Blogger Con and I know there are tons of bloggers who do not see value in such an event. Also, Blogger Con has been acquired and has been organized since last year by the BEA event people and … we must admit that last year had some room to improve. Still, we are going again this year because I feel like they listened to our feedback and are trying hard to make it better this year. I mean in the end, it’s amazing – they are hosting an event only for us Book Bloggers!! For me, it feels that we are appreciated and recognized as part of the business. Also, since it is the day before BEA, you can meet some bloggers you haven’t known before, which makes it easier when you are meeting so many people in the lines at BEA. Now, I’m sure many of you have heard about the “publisher parties”. These are events only for a limited amount of bloggers and they are all invite only. How do you get such an invitation? *shrugs* You just do or you don’t. I’m sorry for not having the answer you might seek. When we were at BEA for the first time, we weren’t invited to any parties and you know what? We still had tons of funs! We loved being at BEA, and we spent time in the evening with friends and just hung out. My point is, don’t stress over these parties. You will get an invite or you don’t. There is nothing you can do about it, especially not nagging the publishers. Those events have limited space so naturally, they cannot invite everyone. Take your time at BEA to network and connect with publishers, because then maybe next year you’ll also get an invite to one of these parties. Never forget – there are tons of things to do in New York. *Pushy pops up* I will fully admit, the first year we went, a bloggy friend of mine told me about how she was going to all these fabulous parties and I felt…like the stinky kid. 🙁 But Danny’s right, we had so much fun and made so many contacts, both with publishers and authors!! One other thing to keep in mind is that if you do get a bunch of invites, that there’s only so much you can do in one day…don’t over book yourself because honestly, this is supposed to be fun, right? Follow TAC on Twitter as they will reveal the Author list today!! I’ll update this post as soon as we know who will be there! Then you should check Books Of Wonder for their events – they always have amazingly awesome signings and I’m excited to see who will be there this year! P.S: we are still gathering questions which we will answer in next week’s posts! Submit Your Question here. 2013 BEA Post Series at The Irish Banana – She really has an amazing series planed, inviting Bloggers, Publishers and Authors for Interviews! Be Sure to check it out! Thanks so much for this, ladies! It’s nice to get something different than the “usual” BEA posts. I mean, I appreciate those too, but as you said, we seem to get a lot of the same information like “Dress comfortably”, “bring a suitcase”, etc. So I like your new take on the BEA tips! Thanks so much for these posts!! I have a lot of blogger friends who are going so I’ve been fortunate enough to get a lot of info from them, but LOVING this break down so I might be able to get a liiiittle more insight for how the conference will go. I’m sure I’ll get there and be completely overwhelmed! Brittany @ The Book Addict’s Guide recently posted..Chantress Blog Tour – Interview with Author Amy Butler Greenfield! At ALA I really wanted to make contacts, I know that it’s mostly the people that associate with librarians and not the contact people we deal with as bloggers, but they do pass on the business cards. They are also at many of these sorts of events so chances are you will see them again. My biggest problem was just remembering them all. I still have a few faces in my head but like no names stuck! So I’m not sure how I can remember these people for next time I see them. I guess I could become the crazy person asking everyone to take a picture with me or something, lol. But maybe once I’m able to attend more conventions the faces will start to stick. Great post 🙂 I’ll be going as well! I hope I get to meet you in line or something!